What Are the Healthiest Grains Out There? Are Some Superior to Others? Whole grains are healthier than refined grains because as their name implies, they contain the entire grain. Refined grains only have one part of the grain, the endosperm where all the carbohydrates are contained. Whole grains on the other hand consist of the germ, the endosperm and bran. Bran is where all the fiber is, along with vitamins and minerals. The germ is where the good fats are along with other vitamins, and the endosperm is the largest part, where all the carbohydrates are. The whole grain containing all three parts is why they are considered to be healthier for us than the refined grains. Whole grains contain more nutrients, and will make you thinner as well. Everyone knows about whole wheat, but eating the same thing over and over can get boring. Plus, there are other healthy options out there as well, so vary up your diet by trying these other healthy whole grains. Rice is a food staple worldwide because it is very nutritious and is easy to grow in flooded or swampy areas. Whole grain rice comes in many varieties and colors, the only one you want to stay away from is white rice which is refined. Rice is a great source of B vitamins, antioxidants and phytonutrients. These nutrients have been linked to fighting cancer, lowering your risk for heart disease, and diabetes as well. Rice comes in many colors as well, including brown, black, purple and red rice. Brown rice is the most healthy version because it goes through the least amount of processing and thus retains the most nutritional value. Popcorn usually isn’t seen as a healthy food because more often than not it is the version that we microwave. This popcorn usually has artificial butter which is not good for our health, and the chemicals in the bag itself have been linked to cancers. Popcorn can be a very healthy food if prepared properly. To do so, you should buy the kernels yourself and pop them in a large pot or an air popper. Add a small amount of salt or other seasonings to make popcorn a healthy snack. Popcorn is full of fiber, good fat, vitamins, minerals and antioxidants as well. When it comes to breakfast foods, oats are one of the best options out there. Oats have been found to reduce cholesterol and are unique in that they have an antioxidant that protects blood vessels against HDL cholesterol. Oats come in many varieties and textures so if you get tired of one variety, try another. 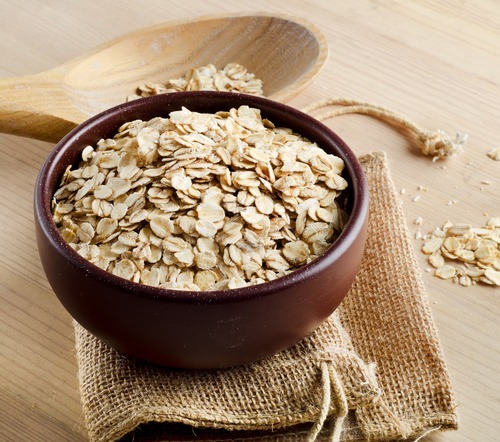 Rolled oats, steel cut oats, and even some instant types of oatmeal contain the bran and germ making them all viable healthy options. An interesting recipe with oats is to throw them in with some chop meat and spice to make a hamburger. The oats do not affect flavor and by eating them you will reduce the spike in bad cholesterol you usually have as the result of eating a burger. Quinoa is unique in that it is the only grain on this list that is a complete protein, or that it contains all the necessary amino acids for humans to function. 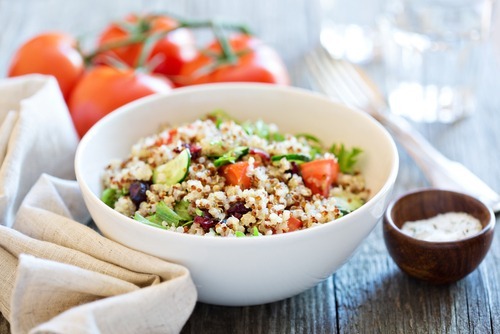 This makes Quinoa a popular choice among vegetarians and vegans who have a hard time finding food items in their diets that are complete proteins. Quinoa is also good for those who want to control their blood pressure, as it is high in potassium. Potassium helps to maintain the balance of Sodium in the blood which can lead to high blood pressure and cardiovascular problems. Quinoa is a great substitute for rice, or can be used in soups or salads. Beer is the first thing that comes to mind when most people think of barley, but it can be a healthy part of your diet as well. Barley contains an extremely high amount of fiber which helps with digestion. Barley helps to promote digestive health by feeding the “good” bacteria in our guts and has shown to reduce cholesterol more than oats. Barley is great in soups or stews or can be used as a breakfast grain similar to how you would use oats. Barley also contains amino acids that help to maintain blood sugar stability, which is a major reason why many people eat it for breakfast to start off their day.